Willow Creek Women's Hospital, a 30-bed facility in Johnson, Ark., is part of Northwest Health System and offers a comprehensive list of services just for women, all under the same roof. 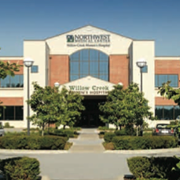 As Arkansas' only full-service women's health provider, Willow Creek Women's Hospital offers services ranging from annual exams and mammography, to diagnosis and treatment for infertility. Services include Same-Day Annual Exams and Mammography, Labor, Delivery, Recovery and Postpartum Suites, Cosmetic and Reconstructive Surgery, Childbirth and Parenting Education, Wellness and Nutrition Classes, Full OB/GYN Services, Diagnostic Lab, Ultrasound Technology, Bone Densitometry, Bladder Control Diagnosis and Treatment and Infertility Diagnosis and Treatment. Arkansas boasts charming small towns that lure travelers seeking a restful reprieve from the hurried pace of modern life. rkansas's varied geography and its location in the U.S. heartland have contributed to make the state's history an intriguing slice of America's story.